Western Digital introduces new WD RE enterprise hard disks, with capacities of up to 4TB. Available in SAS and SATA 6Gbps editions, these 7200RPM 3.5" HDDs feature five platters with up to 800GB of storage capacity per platter. The SAS 6Gbps models are available in 1TB, 2TB, 3TB and 4TB capacities for $139, $249, $369 and $479, respectively, while the SATA 6Gbps variants ship in 2TB, 3TB and 4TB capacities for $229, $349 and $459, respectively. WD®, a Western Digital company (NASDAQ: WDC), and a leader in the mobile, desktop, high-capacity enterprise and consumer markets for hard drives today announced it is further expanding its enterprise-class storage offerings with the release of new WD RE SAS and WD RE SATA hard drives in capacities up to 4 TB, the largest on the market today. Available immediately in 1 TB, 2 TB, 3 TB and 4 TB capacities for nearline SAS and 2 TB, 3 TB and 4 TB for SATA, the 3.5-inch WD RE SAS and WD RE SATA hard drives offer the powerful combination of enterprise-class features and superior capacity to meet the growing demands of conventional business-critical environments as well as the high-capacity and performance requirements of cloud and scale-out computing. "Given the insatiable need for storage capacity across all market segments, WD is offering both SAS and SATA interfaces for the WD 4 TB RE hard drives to best support both private and public clouds," said Doug Pickford, senior director of business marketing for WD's enterprise business unit. "WD continues to pioneer the capacity-optimized 3.5-inch market segment, in particular, and the WD RE SAS and SATA 4 TB drives are designed, tested and optimized for enterprise storage and applications, enabling 33% greater capacity than previously available drives and up to 2.4 PB of raw capacity in a single enterprise rack." "With the new 4 TB 7,200 hard disk drives from WD, the Dell PowerVault MD3 Array series will offer customers more storage capacity than ever before." said Brett Roscoe, general manager and executive director, PowerVault and data management solutions, Dell Storage. 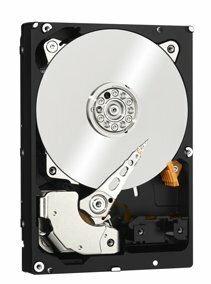 "The new 4 TB HDDs on our recently announced MD3 Dense arrays will allow our customers to store even more data in a compact form factor, with up to 240 TB of data storage in a single dense array and up to a maximum of 720 TB utilizing a single MD3 Dense array and two 60 disk MD3 expansion enclosures." "High density storage, low power consumption, and reliability are crucial for Cloud, Big Data, and data center infrastructures and services," said Andy Morgan, senior director of Storage Platforms at Xyratex. "Through the early qualification of our partner's enterprise products like WD for compatibility with our own OneStorTM solutions, we are providing our OEM customers a means to address these requirements and profit from these growing markets." 1.4M hours MTBF / 1.2M hours MTBF: Provides the highest level of reliability for 24x7 and up to 100% duty applications, for the WD RE SAS and SATA, respectively. Highest Reliability: 5-disk platform, 800 GB per platter, SAS-interface, 6 Gb/sec transfer rates built for high performance 24x7. Available through select distributors and resellers, the 3.5-inch WD RE SAS and WD RE SATA hard drives are covered by a five-year limited warranty.